In hydrocarbon-producing sedimentary basins, the crust can be modelled as a poroelastic medium. The stress state of a poroelastic medium, which entails both the shear and normal stress of the rock, is influenced by pore-fluid diffusion. Coulomb stress changes due to pore pressure changes in a poroelastic medium may lead to microseismic events. This is also true of any hydraulic fracturing where the fluid injection changes the pore pressure and hence, changes in the mean stress of the medium. Despite the fact that poroelastic dynamics are highly complex even with homogeneous properties, understanding the physical process of pore-fluid induced microseismicity is critical to planning and carrying out successful hydraulic-fracturing experiments. In this work, we introduce the concept of Coulomb failure stress changes as applied to the study of regional static stress changes in tectonically active earthquake areas causing spatially predictable aftershocks. We consider the reasons to think beyond the double-couple mechanism as a source characteristic for microseismicity due to hydraulic fracturing. Here, we show examples of Coulomb failure stress maps for the first time to our knowledge when non-double-couple mechanisms operate. Coulomb stress failure changes have been extensively studied in the context of earthquakes where the source mechanism is dominated by double-couple mechanisms. For reasonably well-estimated moment tensors from the measured three-component waveforms at many seismic stations favorably located in the vicinity of earthquake prone areas, automated methods are now available to compute the Coulomb stress failure maps (Lin and Stein, 2004; Toda et al., 2005; Toda et al., 2011). Such maps are routinely generated for earthquakes on strike-slip faults, normal faults, and reverse faults. The maps contain both positive and negative stress failure regions with positive regions spatially designated as regions favoured for aftershocks. The importance of pore pressure changes subsequent to earthquakes in releasing fluids along faults and fractures, and in the spatial distribution of aftershocks in actively tectonic zones has been the subject of research studies in recent years. Not surprisingly, what has been observed for large earthquakes is found to hold good for microseismic events and their aftershocks. It is becoming a common industry practice to collect microseismic data from either one or many observation wells with a multiple array of sensors. In addition to accurately locating the events, establishing their mechanisms is an important issue. The accuracy of the location information is much sought after particularly when only one well is present and the velocity information of the invaded formation from the injected fluid is not fully factored into travel-time procedures. Despite these challenges, rapid strides in advancing accurate determination methods are being made. Aside from the commonly understood and accepted double-couple slip mechanisms for the occurrence of microseismic events in a hydraulic fractured medium, the role of compensated linear vector dipole (CLVD) and the isotropic tensor components has been stressed in recent studies (Baig and Urbancic, 2010). In this work, we visit the topic of Coulomb stress failure changes as has been applied to strike-slip fault earthquakes in predicting the spatial distribution of aftershocks. Against this background, we consider the pore pressure changes of fluids on aftershocks in tectonically active regions and in creating earthquake swarms upon injecting fluid into a formation to enhance oil/gas production in a sedimentary basin. We point out the growing role of a weighted moment tensor solution with double couple, non-double couple and volumetric components. King, Stein and Lin (1994) have successfully applied the static Coulomb failure stress changes for any earthquake event where the source characteristics for a given moment magnitude are known from well-established moment tensor inversion methods. Figure 1 illustrates one example where they have demonstrated the usefulness of their method in identifying the spatial locations of aftershocks of earthquakes with the positive Coulomb failure stress changes. Adapted from King, Stein, and Lin, Bull. Seism. Soc. Am. (1994). Figure 1. (left) The axis system used for Coulomb stress (after King, Stein and Lin, BSSA, 1994); (right) The largest Coulomb stress changes at depths between 0 and 12.5 km caused by the Landers, Big bear and Joshua Trees earthquakes with the first 25 days of seismicity. Also shown are the largest two aftershocks to occur during the following 8 months, the November 17, 1992 (ML = 5.3) and December 4, 1992 (ML = 5.1) shocks (from King, Stein and Lin, 1994). Naturally-occurring fractures and induced fractures influence processes such as formation of ore deposits, changes in fluid pressure and stress states during earthquake cycles, flow in hydrothermal systems, and performance of hydrocarbon reservoirs (Hickman et al., 1995; Sibson, 1997, 2000; Berkowitz, 2002; Bosl and Nur, 2002; Rothert and Shapiro, 2003; Miller et al., 2004; Fischer and Horalek, 2005; Edelman, 2006; Fischer et al., 2008; Maxwell et al., 2010; Barnhoorn et al., 2010). Induced fracturing in formation rocks has been used to enhance oil and gas production in exploration industry for several decades, as was initially documented in the middle of the twentieth century (Clark, 1949; Hubbert and Willis, 1957). Geometrically speaking, naturally-occurring and induced fractures vary in length scale, ranging from micrometers to centimeters. Induced fractures from hydraulic fracturing are closely associated with microseismic events. We assume that for the magnitudes of these events that usually lie between -1 and -3, there is a fraction of a millimeter to millimeter in displacement due to shear or a few millimeter squared in rupture area. Since there is no a priori or a posteriori structural information available, we undertake modelling studies. Figure 2. (left) A model comprising shear, extensional, and extensional-shear fractures developed. This one diagram could represent an extensional normalfault stress regime when upright, a compressional thrust-fault regime when viewed sideways, and a strike-slip regime in plan view; (right) Mohr diagram with composite failure envelope for intact rock with tensile strength, T.
For the hydraulic fracturing experiment, we consider the approach of Sibson (1997) to be valid. As shown in Figure 2 (left), the formation rock is made up of layers of inter-linked “meshes” subsequent to hydraulic fracturing. For such a scenario, we use the Coulomb failure stress condition, as represented by the Mohr diagram (Figure 2 (right)). We look upon the red-hashed area within each mesh as being representative of the rupture geometry. Although the Hill model (1977) is representative of fractures, based on geologic evidence, what combination of double couple, non-double couple, and volumetric forces would emulate them is not an easy problem. The generality of the mesh model, however, is appealing since the embedded features in them can be easily incorporated into a complex network model for a study of the fluid-induced fractures, recently suggested by Vasudevan and Eaton (2010). Adapted from Baig and Urbancic, The Leading Edge (2010). Figure 3. (left) A source-type diagram for microseismic events in a hydraulic fracturing experiment. A microseismic event with a hybrid source mechanism comprised of double-couple, compensated linear vector dipole, and isotropic contributions to the moment tensor enters as a point in this diagram; (right) A source-type diagram for one treatment in a well from a field. In spite of the challenges, attempts have been made to use sourcetype diagrams (See Figure 3), with them populated with microseismic events satisfying certain hybridization of all different types of forces contributing to the source mechanism (Hudson et al., 1989; Urbancic et al., 1993, Baig and Urbancic, 2010). We consider in this paper how we deal with the generation of time-dependent Coulomb failure stress maps, given a microseismic catalogue generated from a six-stage hydraulic fracturing experiment. We use the stage 6 results from a microseismic catalogue derived from a hydraulic fracture treatment in central Alberta. In the map view of the location of the experiment, we illustrate all of the recorded events, marked in blue, and the first 100 events, marked in red, in Figure 4. The events have registered a magnitude less than -1 and greater than -3. This means that each one of the events has undergone not only very minute volumetric change but also slip or displacement due to shear. The data in this graph not only show distinctive clusters but also reveal near-field and far-field occurrences. Figure 4. Recorded microseismic events (marked blue) for stage 6 of a six-stage microseismic experiment. For the computation of Coulomb failure stress changes, we used a maximum of 100 events (marked red). 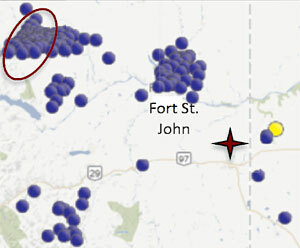 The black line shown in the map view of the experimental location indicates where the six-stage hydraulic fracturing is done. We compute the Coulomb failure stress changes using the recipe given by Okada (1985) and Toda et al. (2010). To keep the process tractable, we have made a few assumptions. We treat all microseismic events alike in the initial treatment. For any given window of microseismic events, we keep the total magnitude to be less than -1, thus honouring qualitatively the magnitude of any given event to be closer to -2. We assume that the minimum horizontal stress direction and the strike direction for all the events are the same. For simplicity, we keep the volumetric changes from crack opening and crack closing the same for all events. To accommodate non-double couple source mechanisms, we assume the CLVD to be a linear combination of double couple source mechanisms. Finally, in the spirit of keeping all microseismic events alike, we do not alter the source-characteristics for the events for any given double-couple forces. We use the software, Coulomb 3.2 (Toda et al., 2010) to do the necessary computations for Coulomb failure stress changes with input parameters associated with fracturing and the associated microseismicity in the upper crust. With the conditions specified above, we calculated the Coulomb failure stress changes for the first 25, 50, 75 and 100 events from the catalogue. Here, we assume the role of only shear failure caused by the strike-slip mode. For the double-couple mechanism in operation, we present the Coulomb maps for the four panels in Figure 5. To conform to the general usage of the maps, the positive Coulomb failure changes are marked in shades of red and the negative Coulomb failure changes are marked in shades of blue. The zones corresponding to a positive Coulomb stress change are indicative of likely places where the “next” failure occurs with a new node to the fracture network. It is important to note that although the stressfield changes associated with microseismicity are very small, for an easy understanding of the process, we scale the stress-field images. Figure 5. Maps of Coulomb failure stress changes. In the initial set of numerical experiments, we consider only the participation of double-couple mechanism. Here, the strike-slip forces are the driving forces from hydraulic fracturing. a) 25 events; b) 50 events; c) 75 events; d) 100 events. The fracture propagation is from northeast to southwest direction in the map view of the four panels. Even with the map view of the Coulomb maps, it is easy to ascertain the direction and orientation of the fracture growth. First, we go from the first 25 events to 100 events, the hydraulic fracturing in this instance near- and far-distance events with respect to the source. Second, the directionality, which is roughly in coincidence with the maximum stress-field direction, of the fracture growth appears to be established in the initial stages of hydraulic fracturing. Third, there is a notable absence of an increase in trend of microseismic events in zones where the Coulomb failure changes are negative, roughly in coincidence with the least stress-field direction. As was stated earlier, the hydraulic fracturing could be closely modelled after tensile crack opening followed by tensile shear (Figure 3). A close analogy to this is found with microseismicity in geothermal reservoirs or in seismicity- swarms noted around a cauldron of a volcano (Julian and Sipkin, 1985; Miller et al., 1998). 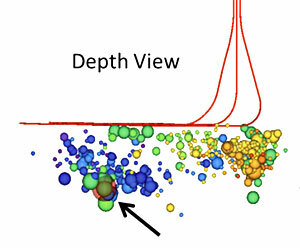 In the latter case, moment tensor inversion of the observed seismicity-swarms points to forces that accrue from volumetric and deviatoric components. A unique way of representing the solution in terms of simple tractable components is not easy. However, for a model that would closely mimic the hydraulic fracturing experiments in some cases, the forces are non-double such as compensated linear vector dipole (CLVD) in nature. Any uniaxial compression or tension associated with high-pressure fluid injection follows the CLVD source mechanism. The CLVD can be expressed as a linear combination of two orthogonal double-couple forces. Again, we face a problem of the weights of the linear combination. For demonstration purposes, we show in three panels (Figure 6) the results of tensile extension and strikeslip occurring in a coupled fashion. They also lend support to source-type diagrams such as the one given in Figure 3. Figure 6. Constructing Coulomb failure stress maps for CLVDs using a superposition of two orthogonal double-couple forces: a) 25% strike-slip + 75% tensile shear; b) 50% strike-slip + 50% tensile shear; c) 75% strike-slip + 25% tensile shear. We use the first 100 events from the microseismic catalogue. From Figure 6, it is evident that the weights of the linear combination dictate the relative direction in which the fracture growth could occur. Larger the strike-slip component is more pronounced is the direction in which the fracture growth is likely to occur. In Figure 7, we overlay all of the microseismic events that fall within the study window used on the Coulomb map corresponding to Figure 6c. This simple illustration suggests that a majority of the events fall in the positive zone of the Coulomb failure stress map. Since we did not capture the Coulomb failure map with the advancing stress-front, i.e. mapping beyond 100 events, it is not surprising to see some events from the catalogue fall in the negative zone of the Coulomb failure map. With this simple framework in place, it is possible now to relax the constraints imposed in generating the maps of the failure stress changes. One of the significant steps forward here might be that we could start quantifying the influence of hydraulic fracturing and the performance of the formation that has undergone it. Figure 7. Overlay of all the microseimic events that fall within the chosen window for the mapping of Coulomb failure stress changes. For illustration purposes, we consider the Figure 6c example. Understanding the conditions under which Coulomb failure stress changes in a brittle crust under the influence of pore pressure changes of the injected fluid become positive is important. The crust in hydrocarbon producing sedimentary basins is under stress even in its undrained state of the pores. 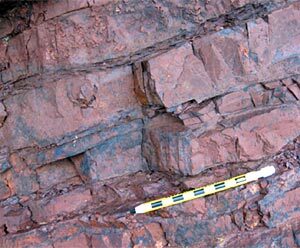 Whether or not the formations have naturally occurring fractures and faults, any increase in pore pressure means an increased resistance to normal forces. When the shear stress failure criteria are met, slip will occur on the existing fractures and faults, or new fractures will form. 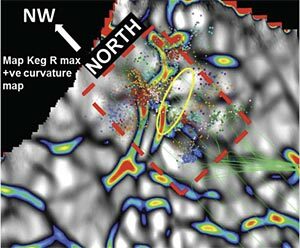 Usually, these new fractures are oriented in the regional stress field. For a fluid injection along the minimum shear stress direction, i.e. the least principal stress axis, fractures appear in a direction perpendicular to this, i.e. along the greatest principal stress axis. Results of hydraulic fracturing experiments seem to suggest that in addition to shear failure, tensile cracking with initial extension and extensional shear could influence and in some instances, dominate the Coulomb failure stress changes. To accommodate this scenario, provision should be made for depicting the Coulomb failure stress changes when doublecouple and non-double couple forces operate. We have shown here examples of Coulomb failure stress maps in such instances. Maps of static stress changes in the initial stages of fracture growth point to the orientation and direction of fractures within which microseismic events have taken place. Generating the Coulomb failure stress maps on a routine basis for analysis is impeded by the lack of information on exact locations of microseismic events and their source characteristics of microseismic events in many instances, thus lowering the expectation of reasonable sub-surface fracture maps from Coulomb stress field maps. We also notice that fluid injection at any stage of the hydraulic fracturing experiment causes near- as well as far-field stress changes. This is manifested in the near and far locations of the events with reference to the source pulse. In this study, we have provided examples of Coulomb failure stress maps in 2D, although the stress changes take place in 3D. This will be the topic of discussion in our future papers. Since the spatio-temporal occurrences and recurrences of microseismic events are complex, understanding the dynamic stress changes in any hydraulic fracturing experiment is crucial. In the light of observations noted above, it would be a useful exercise to supplement the observed microseismic experiments with Monte- Carlo simulations of hydraulic fracturing and generating the Coulomb failure stress maps of resulting fractured networks. The authors would like to acknowledge the Natural Sciences and Engineering Research Council of Canada for financial support. They express their gratitude to Microseismic Industry Consortium for their support and providing their permission for publication of the material reported in this paper. Kris Vasudevan is a research associate in the department of geoscience at the University of Calgary. His current research interests are earthquake seismology, microseismicity, and seismic hazard analysis. He is a member of CSEG, CGU, AGU, EGU, and APEGGA. David W. Eaton is Head of the Geoscience Department and a Professor of Geophysics at the University of Calgary. He joined the department in 2007, after spending nearly 11 years as a professor at the University of Western Ontario. Dave’s industry experience started after a B.Sc. from Queens in 1984, and included Chevron, Home Oil, and Pulsonic before completing a M.Sc. and Ph.D. from the University of Calgary in 1988 and 1991. Baig, A., and Urbancic, T., 2010, Microseismic moment tensors: A path to understanding frac growth: The Leading Edge, 320-324. Berkowitz, B., 2002, Characterizing flow and transport in fractured geological media: A review: Advances in Water Resources, 25, 861-884; doi: 10.1016/S0309- 1708(02)00042-8. Bosl, W.J., and Nur, A., 2002, Aftershocks and pore fluid diffusion following the 1992 Landers earthquake: J. Geophys. Res., 107(12), No. B12, 2366; doi: 10.1029/2001JB000155. Clark, J.B., 1949, A hydraulic process for increasing the productivity of oil wells: AIME Trans., 186, 1-8. Edelman, I., 2006. An analytical interpretation of liquid injection induced microseimicity in porous reservoirs: Soil dynamics and Earthquake Eng., 26, 566-573. Fischer, T., and Horálek, J., 2005, Slip-generated patterns of swarm microearthquakes from West Bohemia/Vogtland (central Europe): Evidence of their triggering mechanism? : J. Geophys. Res., 110, B05S21. Fischer, T., Hainzl, S., Eisner, L., Shapiro, S.A., and Le Clavez, J., 2008, Microseismic signatures of hydraulic fracture growth in sediment formations: Observations and modeling: J. Geophys. Res., 113, B02307; doi: 10.1029/2007JB005070. Hickman, S., Sibson, R., and Bruhn, R., 1995, Introduction to special section: Mechanical involvement of fluids in faulting: J. Geophys. Res., 100, 12,831-12,840; doi: 10.1029/95JB01121. Hill, D. P., 1977, A model for earthquake swarms, Journal of Geophysical Res., 82(8), 1347-1352, doi:10.1029/JB082i008p01347. Hubbert, M.K., and Willis, D.G., 1957, Mechanics of hydraulic fracturing: AIME Petroleum Trans., 210, 153-166. Hudson, J., Pearce, R., and Rogers, R., 1989, Source type plot for inversion of the moment tensor, J. Geophys. Res., 94, 765 – 774. Julian, B.R., and Sipkin, S.A., Earthquake processes I the Long Valley Caldera area, California, 1985, J. Geophys. Res., 90, 11,155-11,169. King, G.C.P., Stein, R.S., and Lin, J., 1994, Static stress changes and the triggering of earthquakes: Bull. Seism. Soc. Am., 84(3), 935-953. Lin, J., and Stein, R.S., 2004, Stress triggering in thrust and subduction earthquakes, and stress interaction between the southern San Andreas and nearby thrust and strike-slip faults, J. Geophys. Res., 109, B02303, doi:10.1029/2003JB002607. Maxwell, S.C., Rutledge, J., Jones, R., and Fehler, M., 2010, Petroleum reservoir characterization using downhole microseismic monitoring: Geophysics, 75(5), 75A129- 75A137. Miller, A.D., Foulger, G.R., and Julian, B.R., Non-double-couple earthquakes 2. Observations, Rev. Geophysics, 36(4), 551-568 (1998). Miller, S.A., Collettini, C., Chiaraluce, L., Cocco, M., Barchi, M., and Kaus, J.P., 2004, Aftershocks driven by a high-pressure CO2 source at depth: Nature, 427, 724-727; doi: 10.1038/nature02251. Okada, Y., 1985, Surface deformation due to shear and tensile faults in a half-space, Bull Seism. Soc. Am., 75(4), 1135-1154. Rothert, E., and Shapiro, S.A., 2003, Microseismic monitoring of borehole fluid injections: Data modeling and inversion for hydraulic properties of rocks: Geophysics, 68(2), 685-689. Sibson, R.H., 1997, Structural permeability of fluid-driven fault-fracture meshes: J. Struct. Geology, 18, 1031 - 1042. Sibson, R.H., 2000, Fluid involvement in normal faulting: J. Geodynamics, 29, 469-499. Toda, S., Stein, R.S., Richards-Dinger, K., and Bozkurt, S., 2005, Forecasting the evolution of seismicity in southern California: Animations built on earthquake stress transfer, J. Geophys. Res., B05S16, doi:10.1029/2004JB003415. Toda, S., Lin, J., and Stein, R.S., 2011, Using the 2011 M=9.0 Tohoku earthquake to test the Coulomb stress triggering hypothesis and to calculate faults brought closer to failure, Earth, Planets and Space, In press. Urbancic, T.I., Trifu, C-I., and Young, R.P., 1993, Microseismically derived fault-planes and their relationship to focal mechanism, stress inversion, and geologic data, Geophys. Res. Lett., 20, 2475 – 2478. Vasudevan, K., and Eaton, D. W., 2010, Complex network model and Coulomb stress failure changes, Unpublished results. Vavryčuk, V., Bohnhoff, M., Jechumtalova, Z., Kolar, P., and Sileny, J., 2008, Nondouble- couple mechanisms of microearthquakes induced during the 2000 injection experiment at the KTB site, Germany: A result of tensile faulting or anisotropy of a rock? : Tectonophys., 456, 74 - 93.